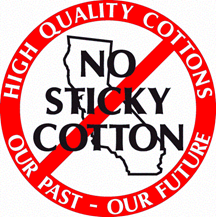 Early in the month of June, the California Cotton Ginners and Growers Associations paired with UC IPM to hold three regional whitefly meetings to address and prevent the issue of sticky cotton. Many growers in the SJV region experienced an uncharacteristic increase in whitefly populations in the 2013 growing seasons. The “Whitefly” meetings took place in Tulare, Five Points, and Shafter and included guest speakers and longtime cotton experts Pete Goodell (Cooperative Extension Advisor, IPM) and Larry Godfrey (UC Extension Entomologist). The meetings focused on whitefly biology, effective management strategies, and the serious negative impacts of sticky cotton at the mills. Godfrey and Goodell have provided excellent information on whitefly biology and management for growers, PCAs and other interested parties. They are available to you below. The biggest take home message for growers and PCAs who attended the meeting was to carefully watch and sample developing populations and to treat timely and appropriately! If you have questions regarding sampling methods or whitefly management, or hear about potential problems, Pete Goodell has graciously offered his help and can be contacted through the association or at pbgoodell@ucanr.edu. This entry was posted in NEWS & ISSUES on July 3, 2014 by ccgga.